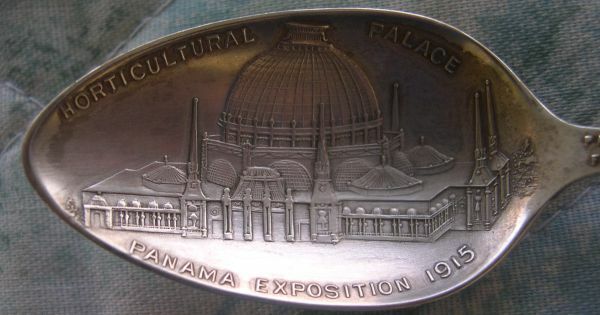 The opening of the Panama Canal (the world's largest and most expensive building project to that date) was the primary reason for the Pan Pacific International Exposition (PPIE). 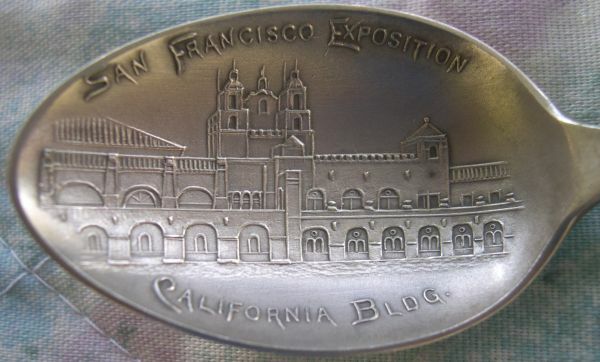 It is not possible to overestimate the importance of the canal to the United States and particularly California. 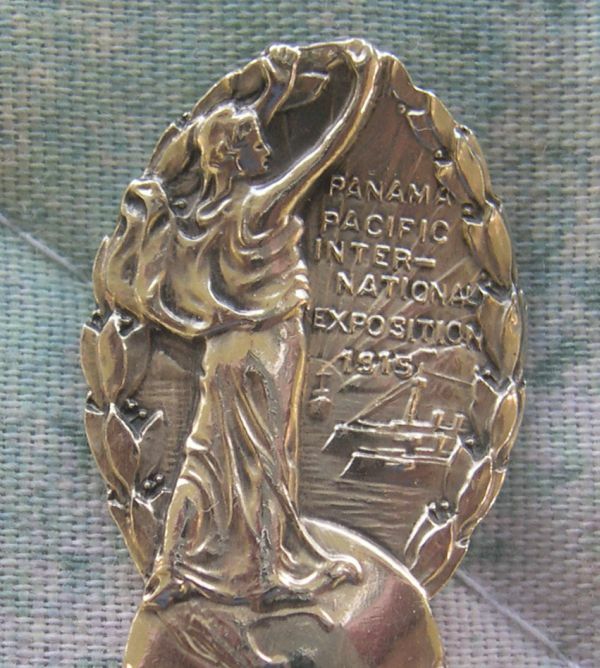 The Panama Canal was an engineering marvel which significantly shortened the distance (by almost 8000 miles), length of time and safety required to transport goods and people by sea from the eastern United States and was a major impetus to the development of trade routes. Teddy Roosevelt was the first sitting president to leave the country while in office, and his trip was to visit the construction of this canal. 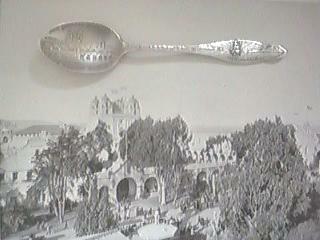 See the link at the end of this exhibit to see these spoons. 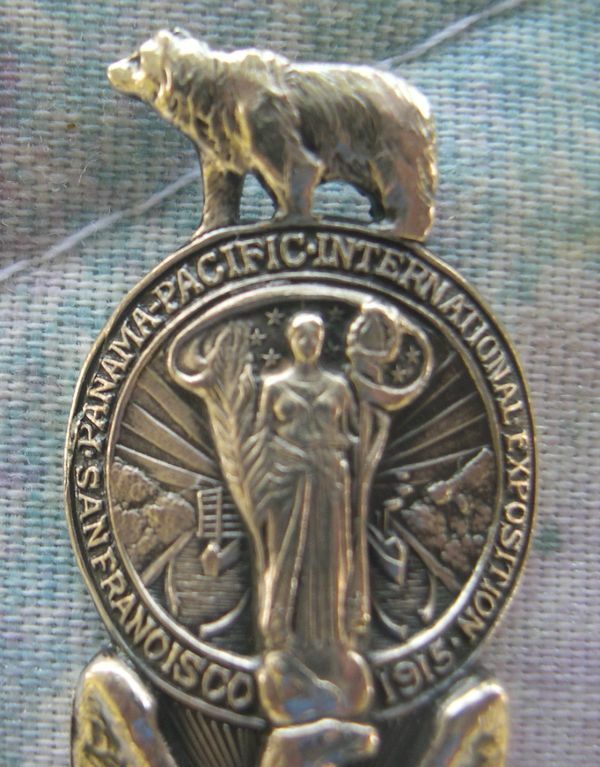 The "state animal" for California is the bear which is why it is frequently seen on California spoons. 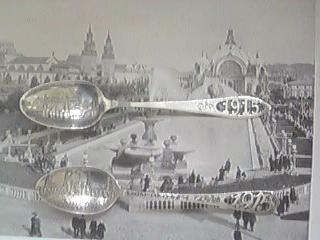 President William H. Taft used a shovel made out of gold to start the building project for this fair. 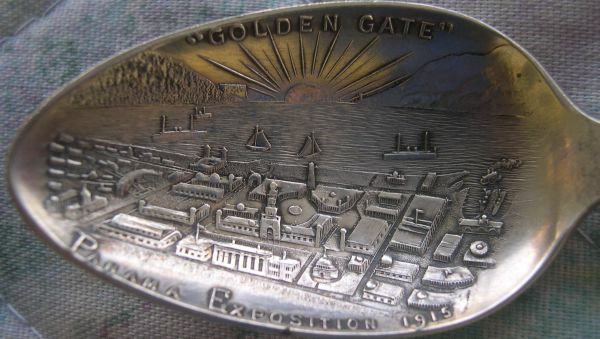 That golden shovel is now in a museum in San Francisco, California. 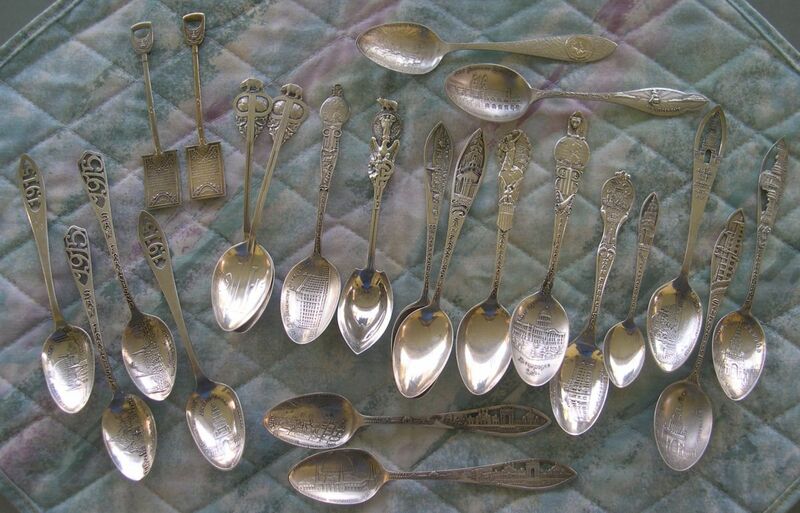 The Shreve silver manufacturing company which made the shovel also made these exact miniature vermeil replicas for sale as souvenirs. 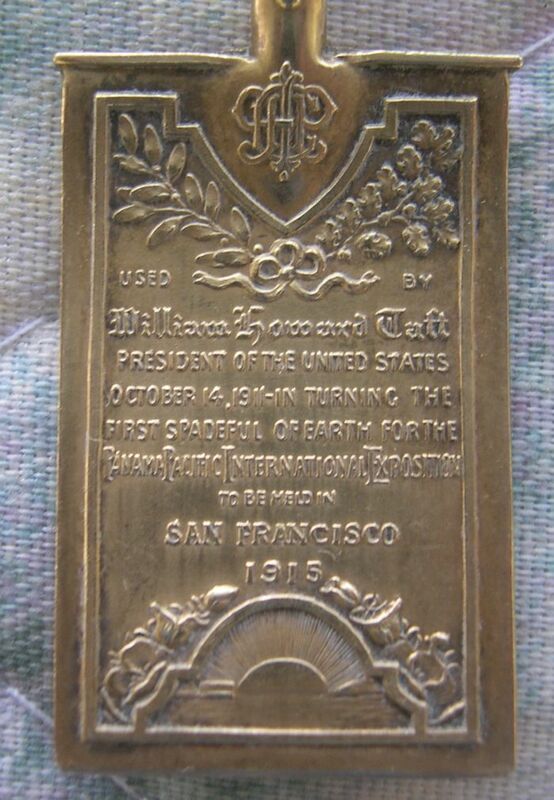 "used by William Howard Taft, President of the United States, October 14, 1911-in turning the first spadeful of earth for the Panama Pacific International Exposition to be held in San Francisco, 1915"
The background photo's are from the "official souvenir pictorial book". 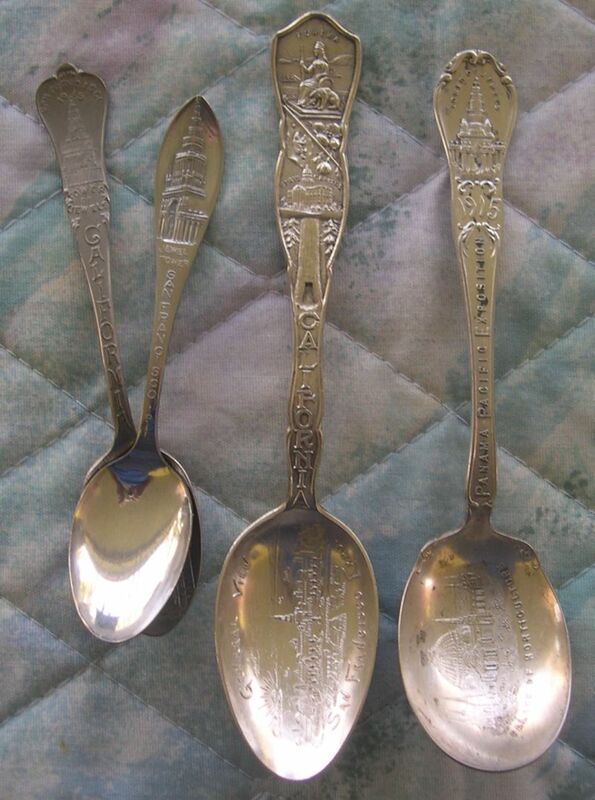 The spoons are placed on the photo per the design in the bowls. 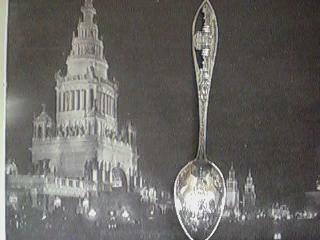 At 435 feet, the Tower of Jewels at the main Scott St. entrance was the tallest building at the PPIE. It was decorated with over 102,000 faceted cut glass jewels that were hung on the building with brass mirrors behind them and the wind made them sway creating an absoluting mesmerizing effect on the viewer. During the nightime, 54 power beams of light were directed at the tower creating a unique effect. 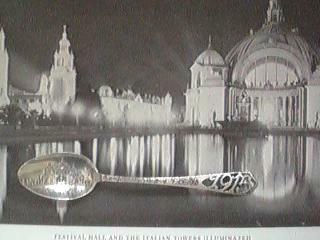 An extraordinary spoon featuring the Tower of Jewels in a cutout handle. Note the very tiny red, white and blue stones in the tower. These most likely are cut glass from the novagems that were hung from the tower. 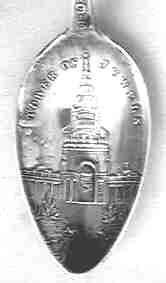 The novagems made for the tower of jewels were later sold as souvenirs and incorporated into other products.